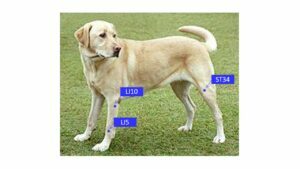 If your dog is an athlete you want to make sure they are getting lots of support for their muscles and tendons. Just like human athletes, Good nutrition is a key part of this and so is after workout care. ie: Massage Acupressure, Acupuncture, Chiropractic, and light stretching to prevent injuries. 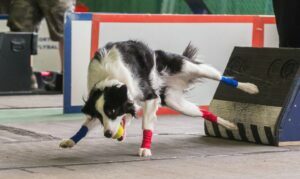 *If your pup plays flyball this is truly important as this sport places a lot of stress on the spine, neck, shoulders, hips knees and muscles and tendons . So keep your pups in good shape and make sure you have an after workout regiment that will keep them injury free and happy. Here are three of many good points to use pre and post workout. LI 10 is located on the outer surface of the thoracic (front) limb 2 cun below LI11 in the groove between the extensor carpi radialis and the common digital extensor muscles (find the outside crease of the elbow and go down between two and three finger widths to the fleshy part of the muscle) see diagram . Helps with movement pain and stiffness in the upper body motor impairment of the upper limbs, pain in the shoulder and back.